Nose: Warm pastry creme, sweet toasted grain and cookie dough. Palate: Fruit cake, and a saltiness that perfectly balances the fruits of the orchard. The finish is long with tangerine hints. Comandon present another unique collaboration using their single-cask innovation; only this time, their precious eaux-de-vie are finished in former sherry casks from Jerez in the south of Spain. 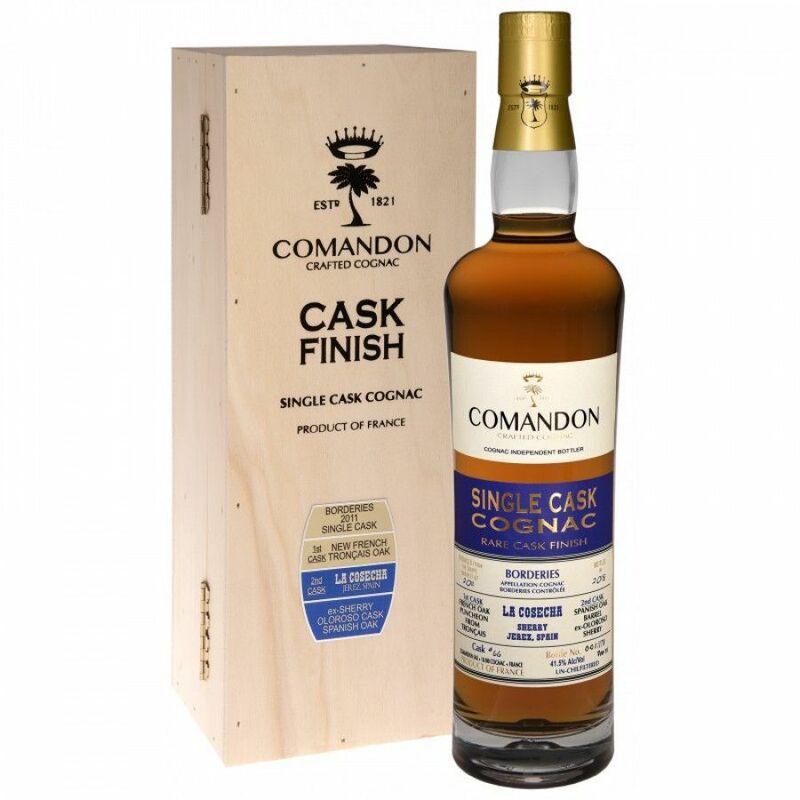 The Comandon Rare Cask Finish Cognac in Ex-Oloroso Sherry from La Cosecha is something to be marveled, and is only produced in small batches so once it’s gone, it’s gone. The Cognac Masters have selected to create an expression of the Borderies terroir, which is the smallest of all the crus but is highly sought-after. It is made up of the oldest soil in the region, and due to millions of years of fossilization, the soil produces high quality eaux-de-vie of an intensely floral nature. This is a Vintage Cognac dating back to 2011, and is a dual snapshot of both Cognac from the Borderies region, alongside Spanish oak and sherry. Truly unique. As an experiment, Comandon have released a fine example of ex-sherry finish Cognac. By collaborating with La Cosecha, one of the most celebrated boutique sherry producers in Spain. Located in Jerez in the south of Spain, Comandon finished their Cognac in their former Oloroso sherry barrels. It gets better - not only is the Cognac finished in Spanish sherry casks, but the oak itself is indeed Spanish. Probably for the first time in Cognac history, you can try Cognac aged in Spanish oak barrels with the Comandon Rare Cask Finish 2011 Vintage. Comandon tend to operate on a ‘once it’s gone, it’s gone’ policy, which means that their batches are smaller and artisanal. Working in tandem with nature, there are only 205 bottles available for this Cognac, so grab it while you can. It arrives in a bespoke wooden box and will look fantastic on display.